So now we're supposed to believe that Vladimir Zhirinovsky and Gennady Zyuganov are the last great defenders of Russian democracy? They were shocked, appalled, and offended that the Kremlin would --ghasp! -- fix an election and decided to make a stand. Yeah, right. Clearly something else is going on here. Following up on Robert Coalson's post earlier today, there are more than a few signs out there that Wednesday's walkout of the State Duma by the so-called loyal opposition -- Zhirinovsky's LDPR, Zyugnov's Communists, and A Just Russia -- was a stage-managed affair that was given a green light at the very highest levels. For one thing, Zhirinovsky, who initiated the walkout, doesn't do anything of this magnitude without an underlying motive (and that motive is never the advancement of democracy), and without prompting from his masters in the Kremlin. And as Danila Galperovich of RFE/RL's Russian Service points out in a commentary today, the floor speeches by LDPR deputies that sparked the walkout, ostensibly in protest of alleged falsifications in the October 11 local elections, "were obviously rehearsed note for note." Moreover, the parliamentary rebellion received extensive -- and largely respectful -- coverage on Russia's main state-run television channels. In the tightly controlled world of Russian television, that doesn't happen by accident. "Could Gennadi Zyuganov, Sergei Mironov, and Vladimir Zhirinovsky with their followers summon the guts for a grandiose scandal without a condescending nod from their curators?" Mikhail Rostovsky asked rhetorically in a commentary in today's edition of "Moskovsky komsomolets." In his commentary (available in Russian here and in English here), Galperovich spells out two possible scenarios, both of which are tied to power struggles at the highest level of the Russian elite. The first of these pits Sergei Naryshkin, the Kremlin chief of staff, against his deputy Vladislav Surkov, the regime's unofficial ideologist. In recent weeks, Russian media has been rife with speculation that President Dmitry Medvedev was about to sack Naryshkin as chief of staff and replace him with Surkov. Naryshkin is closely affiliated with Deputy Prime Minister Igor Sechin, the leader of the siloviki faction of security service veterans surrounding Russia's de facto ruler, Prime Minister Vladimir Putin. Most Kremlin watchers believe he was put in his post to keep an eye on Medvedev, lest he get any crazy ideas about acting like he is actually the president. According to some press reports, particularly a recent story in "Nezavisimaya gazeta," Medvedev's first choice to replace Naryshkin was Justice Minister Aleksandr Konovalov, the president's law school classmate. 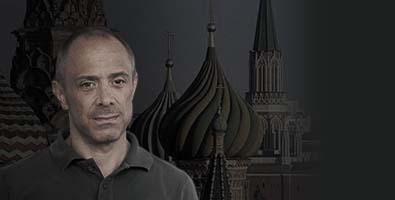 But lacking such latitude, Medvedev reportedly settled on Surkov, a powerful figure and skilful bureaucrat who is also Sechin's bitter rival. According to this scenario, Naryshkin tasked Zhirinovsky with initiating the Duma revolt. The goal was to discredit, embarrass, and emasculate Surkov, whose portfolio includes keeping Russia's political parties docile and obedient. A second scenario outlined by Galperovich also features Surkov, but this time not as the target of this elaborate special operation -- but as its instigator. According to this version, it was Surkov who "activated" Zhirinovsky with the goal of discrediting and weakening Duma Speaker Boris Gryzlov, head of the ruling United Russia faction and another close Sechin ally. The Duma walkout was aimed at United Russia, which won a suspiciously large majority in local elections on October 11, and at Gryzlov in particular. Surkov, the mastermind of Russia's authoritarian system of "sovereign democracy," has been engaged in a low-intensity bureaucratic war with Gryzlov for months over plans to revamp the country's party system. In place of the current system of de facto one party rule by United Russia, Surkov has been seeking to create a pseudo multiparty system with several parties -- all beholden to the Kremlin -- "competed" for voters' allegiance. United Russia would be the first among equals under the new plan, but it would share real power with other factions. The lopsided victory United Russia scored in local elections was widely seen as an effort by Sechin and Gryzlov to crush Surkov's plan and maintain one-party dominance. And the LDPR inspired walkout, according to this scenario, was Surkov's counterpunch. Both of these scenarios ultimately pit Surkov against Sechin. Both are also related to an ongoing struggle in the elite about Russia's future direction, with Sechin seeking to maintain the status quo, while Surkov (and Medvedev) appear to be seeking slight modifications. According to the latest reports, Zhirinovsky (and A Just Russia) have agreed to end their boycott of the Duma, while the Communists are still holding out. The fallout in the coming days and weeks should provide more clues about which of these scenarios -- or another we haven't yet discerned -- is closer to reality.